I was born in May of 1958 in the northern town of Prince Rupert, British Columbia, Canada. When I was 9 years old, my parents moved from the far north to the city of Victoria, furthest south in the province. Victoria is the province’s capital and boasts Canada’s mildest weather. It's a big tourist attraction as well as retirement hot-spot. For it’s size, it is uncommonly clean; a garden city with plenty of outdoor attractions and activities. Not coincidentally, Victoria is the setting for my novel, The Space Between Thought. I was not a very dedicated university student, but my marks in Biology and English have always been impressive. But just to be contrary, I pursued a degree in Physics. I scraped through and managed to attain a B.Sc. from the University of Victoria. I wanted a double degree, but would have had to take another year to get a B.A. in English. I just didn’t have enough momentum left for more school, so I entered the workforce. It had always been my ambition to become a writer but after graduation, my interest in computers led me to managing Victoria’s top computer retailer where I sold and marketed some of the first home computers—like the Vic 20, Commodore 64 and Amiga, nostalgia fans. Unexpectedly, my technical expertise with computers and desktop publishing led to an apprenticeship with the internationally acclaimed Beautiful British Columbia Magazine. Five years later, I left to become the publisher of the now defunct, BC Agriculture Magazine. After this, I co-art-directed several video and television productions, including Take-Off! an acclaimed Canadian television series. Since that time, I have been in business for myself as a marketer, project co-ordinator and sandwich man... whatever paid the bills and still allowed me time to write. In June of 2003 I married Junko. My son, Noah, was born in 2005; my daughter, Rihana, in 2007. Junko is an adept practitioner of the lost art of homemaking who also homeschools our children. Work-wise, I may be retired... haven't yet decided. Currently, I am helping a friend renovate his house which I find very satisfying. To date, I have written three full-length novels. 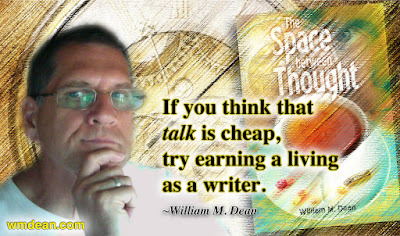 The Space Between Thought is the first to be published. My other two novels are much more straight-up sci-fi—along the lines of the short-lived tv series, Intelligence. Had those two books been published anytime within 10 years of being written, they might have been more interesting, but technological advances have rendered much of that original concept passe. I recently realized that to bring it up to date, I could start by replacing my hero’s name with the word “smartphone.” Still, the characters are interesting, and I do have ideas about a re-write that would inject new life. 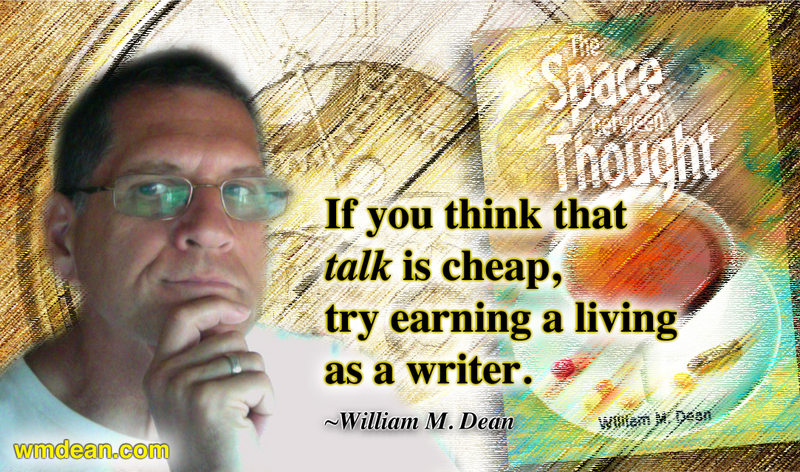 I knew that The Space Between Thought was my most polished work and still relevant and I no longer require an agent or publisher to get the story “on the shelf.” At the urging of my writer-friend, Dan, I elected to self-publish. Dan made it sound so easy: pay some money, send the text, sit back and wait. I have since discovered that Dan can be full of crap. Also, I might possibly be retired, so I really appreciate every book that is purchased.